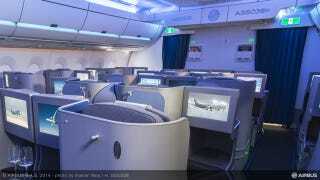 Yesterday in Hamburg at the 2014 Aircraft Interior Expo, Airbus unveiled the primary cabin design of the A350-XWB. While the design remains somewhat customizable, it gave the industry a sneak peak into the interior of the newest medium sized long range jet, expected to be delivered later this year. The new interior demonstrates how the aircraft's "eXtra-wide" fuselage will soon offer passengers even more personal space, flexibility and comfort in business and economy classes, and especially, a wide 18" seat in 9-abreast economy. The 3-3-3 configuration in Economy Class doesn't look too terrible, but the airlines get to decide on two very important comfort factors. First, how much seat pitch (leg room) will they give you? And second, perhaps most-importantly, will they decide to squeeze a 10th seat into the row? A 17-inch wide seat is pretty standard for most airlines in Economy class, but Airbus is promoting the comfort advantages of an 18-inch wide seat as seen in their photos. As we know, wedging more passengers into seats provides more potential revenue to the airline, and reduces the CASM operating cost — which is the cost to fly the seat one mile, a common unit measurement for airline revenue. Also at the Aircraft Interior Expo, Airbus also opened the A350 Customer Definition Center, which is like a showroom where A350 customers come and choose the smaller details of their aircraft interiors. At the Definition Center, Airbus can create a virtual environment for customers to visualize what the final product will look like, from seating and galley configurations, to a choice of 16.7 million LED lighting colors. "Passenger comfort is an increasingly important differentiator for the airline industry, becoming a fundamental deciding factor driving passenger choice and business success. The A350 XWB is the only aircraft in its sector to truly offer 'comfort without compromise', while providing airlines with unrivalled operating economics, flexibility and fuel efficiency." In case you're wondering what the "XWB" stands for, it's eXtra-Wide Body. It's really just a sales gimmick highlighting the fact that it's wider that the A330 it is replacing in the Airbus product stable. Originally, Airbus was going to make the A350 the same dimensions as the A330 — but after Boeing went with a 19.4 foot fuselage diameter for the 787 Dreamliner, Airbus redesigned the A350 to be 19.5 feet diameter and called it the XWB. Airbus had also originally said they wouldn't do a carbon fiber body for the A350, but it was so popular for the 787 because of the efficiency gains and reduced weight that Airbus decided to follow along. According to Airbus' press release, the A35o-XWB has won 812 orders from 39 customers worldwide as of the end of March.